Galaxy Buds, the successor to Samsung’s Gear IconX (2018) earbuds, is inching closer to an official launch. The upcoming wearable was recently certified by Bluetooth SIG. The hardware has now received its certification from the Federal Communications Commission (FCC) in the United States. Samsung is expected to announce the wireless earbuds at the Galaxy Unpacked event on February 20. That’s where the company will be launching the Galaxy S10 and possibly the foldable smartphone as well. 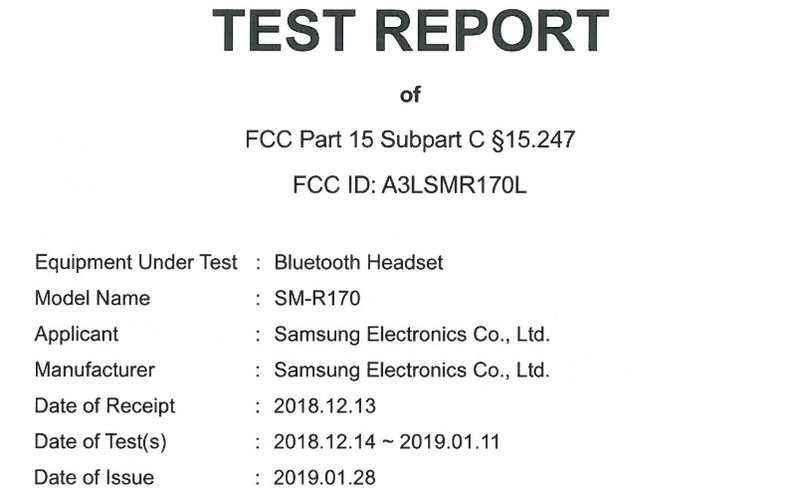 The FCC has just certified a ‘Samsung Bluetooth Headset’ bearing the model number SM-R170. It is the same device that was certified by Bluetooth SIG last week. The device has complied with the necessary standards, suggests the FCC documentation. Furthermore, the certification also reveals that the earphones will be manufactured in Vietnam, where Samsung makes many of its products. The Galaxy Buds will be available in black, white, and yellow, and will come with Bluetooth 5.0 support. The earbuds will also have 8GB of internal storage space. This is more than on any previous Samsung wearable, be it previous IconX models or one of the many Samsung smartwatches. Samsung is expected to unveil the Galaxy Buds alongside the Galaxy S10 on February 20 in San Francisco, California. The company also has a number of other wearable devices in work, including the Galaxy Fit, which received its Bluetooth certification last week. It now remains to be seen how many of them make their way out at the Galaxy Unpacked event next month.